HAPPY NEW YEAR EVERYONE! New Years seems to be a time for Resolutions, but quite honestly, I never make them. Unfortunately, most New Year’s Resolutions are never implemented. The trick is to just add new self-improvement items on a daily, weekly or monthly basis. One at a time would be much easier to do. All that being said, I am making myself a promise that I will pay more attention to this blog and try to write something, if not daily then at least twice weekly. And starting off will be a new series of ‘One Dish Meals’ or almost ‘One Dish Meals’. 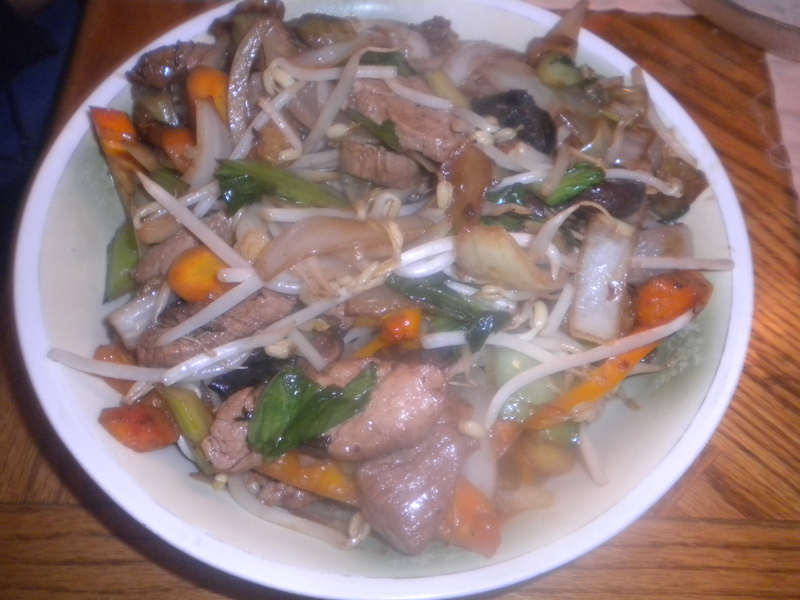 The first one is my Pork Tenderloin Stir Fry that we had for dinner last night. So, here goes! Cut the Tenderloin in half lengthwise and rub with 2 Tbsps. of Granulated Sugar. Let it sit for 15 minutes and then Slice the Pork Tenderloin into thin crosswise slices, being sure to cut against the grain. Completely cover the Tenderloin pieces with the Marinade Mixture. 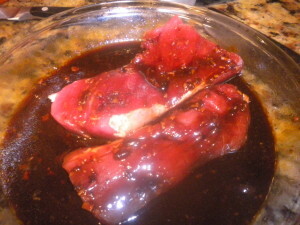 (see recipe) pork-tenderloin-stir-fry/ Cover and refrigerate for several hours or even overnight. Clean the Mushrooms by wiping with a damp paper towel. Remove the stems (Shitake stems are too woody to eat) and then cut into quarters. If they are very large, then just slice crosswise. Peel the Onion and then slice into petals – quarter the Onion and then slice each quarter into ¼” pieces lengthwise. Wash and dry the Scallions and cut crosswise into thin slices – both the White and Green Parts. Peel the Carrots and then slice diagonally into 3/8” slices. Remove the string from the Snow Peas and the stem end. Rinse with cold water and drain. Cut each in half lengthwise. Remove the stem and seeds from the Bell Pepper; wash and dry and then slice into julienne pieces. If these are too large for you, then slice again into halves or quarters. Just before serving time heat a small amount of Peanut Oil (or Vegetable) in a wok or sauté pan. Just enough to cover the bottom of the pan. When the Oil is hot add the Mushrooms and Onions. Sauté until the Mushrooms are soft and the Onion is translucent. Add the Carrot slices and sauté just until the Carrots are almost fork tender. Transfer the Vegetables to a covered dish and then add the Pork. 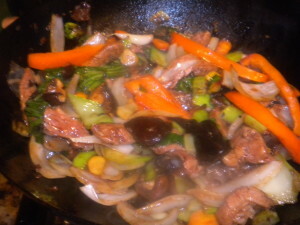 Sauté the Pork for about 2-3 minutes and then add the Sauce Ingredients (See recipe) along with the Snow Peas. Cook for another 2-3 minutes. Return the Vegetables to the wok along with the Bean Sprouts, Scallions and Red Bell Pepper. Cook for another minute or so or until everything is hot. Serve with Rice or Rice Noodles. Voila! Dinner is ready.